Pop. 678. In Devlin T., Rainy River Dist., at the junction ofHwys 11 and 613,22 km. W of Fort Frances. North of Dance T, Rainy River Dist. at the mouth of Christie Cr. on the NW bay of Rainy L., 37 km NW of Fort Frances. Pop. 99. In La Vallee T., Rainy River Dist. on the CNR and Hwy. 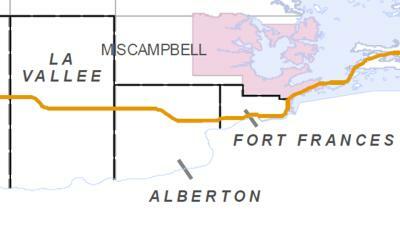 11, 19 km W of Fort Frances. Pop. 1,077. In Lash T., Rainy River Dist., on Rainy R. and Hwys II & 602, 37 km. W of Fort Frances.